Airplane air can play havoc with your skin, so a mid-flight pamper session is not only a fun way to pass the time but helps to keep things hydrated. I don't always have the willpower to foreswear the temptations of the drinks trolley - but I do try to compensate with plenty of water, and lots and lots of product. 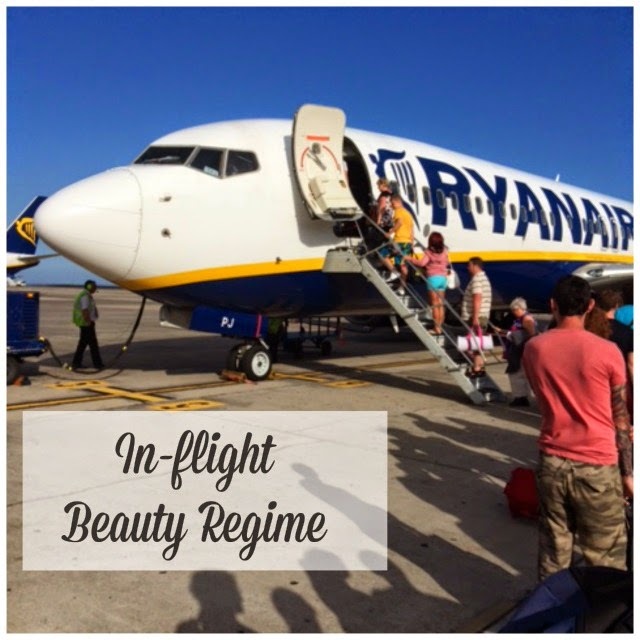 If we're friends on Instagram, Twitter or Facebook you'll know I've just returned from a lovely break in the sun (if you don't, hop over and do it now, don't mind me, I'll hang on here till you get back) and took full advantage of the four hour flight time to primp, preen and generally plump up my skin. Water Wipes are a great travel companion and thanks to their lack of chemical nasties, are just about the only face wipe I won't sidestep - or side-eyes - these days; they work equally well for hands and face. Next up, a new skincare love: Hyalogic Episilk Pure Hyaluronic Acid Serum is a miracle worker for dehydrated skin. Our bodies produce less hyaluronic acid as we age but it's the stuff that attracts and retains moisture in the skin, so applying it topically, or using ingredients which contain it, can really help to plump and smooth. Containing just de-ionised water and hyaluronic acid, this serum is one of my new favourite things - you can use it under your regular face creams or masks and you'll find it on Irish beauty site Dolledup.ie. 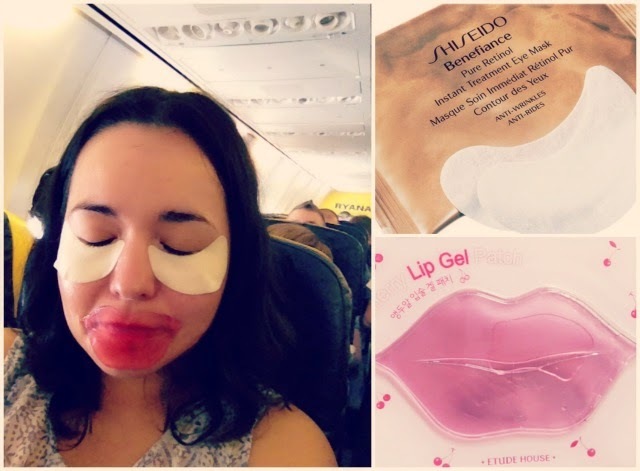 For convenience when travelling, sheet masks are great but, if you're worried about freaking out your fellow passengers (let's face it, those things look crazy) then go for a clear gel mask instead. Look out for sample sizes - I brought the Voya mask from the handy little kit I showed you here - or decant into a little screw top pot (you'll find these in Boots or other chemists). Thankfully, looking mental doesn't phase me, as these photos will attest. Along with my face mask I smoothed on my new Shiseido Benefiance WrinkleResist24 Pure Retinol Express Smoothing Eye Masks and a cherry lip gel mask from Etude House (a pressie from the fabulous Dena). The eye masks are amazing: soaked with retinol, you apply them for 15 minutes to work their magic on fine lines, dryness and the appearance of dark circles, leaving the undereye area looking brighter, smoother and altogether more refreshed. €69.49 is the damage though you do get 12 sets of 2 patches each for that money, and the results are very impressive. The lip mask wasn't quite as transformative although the glycerin did a good job at smoothing and moisturising my lips and the price is a lot more accessible - you can pick them up quite reasonably on Amazon. A thick layer of lip balm - the one I used is from Chanel and quite delicious; I'll tell you more about it soon - and some deliciously zesty Roger & Gallet Fleur d'Osmanthus Hand & Nail Cream, and I was ready for a little snooze. Crucially all this can be done from the comfort of your seat - you don't want to enrage your fellow travellers by hogging the loo while you get your spa on. 30 ml - ideal for travelling! 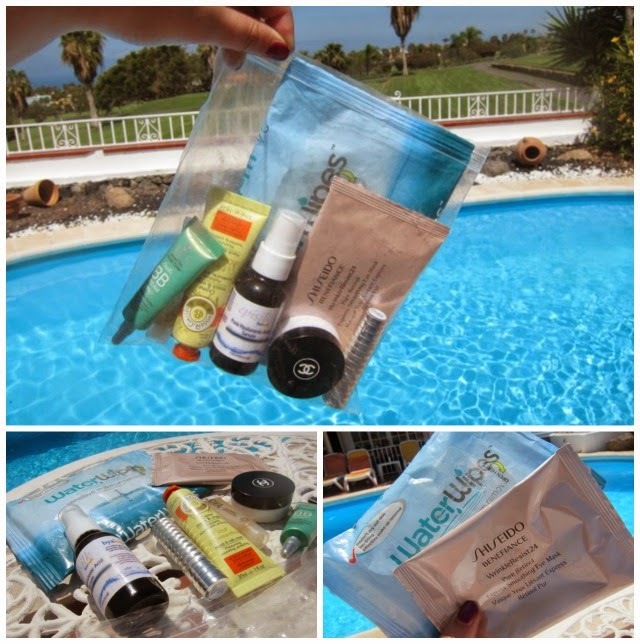 Finally, popping on some BB cream, a bright lip (courtesy of Clinique's Matte Mandarin) and my most oversized sunnies just before landing meant I felt fresh faced and fabulous as I stepped into the gloriously warm Spanish sun.